Peaches evoke memories and bring out the best of summertime activities. There are peach cobbler bake-offs, peach-eating contests, and peach recipes handed down through the generations. Even in the dead of winter, the scent of peaches allows us to look forward to the ripe peaches of summer. Growing peaches has become big business, and growers depend on fruit that can endure the trip to the market. Agricultural Research Service scientists continually strive to develop new peach varieties to meet the needs of growers and consumers alike. 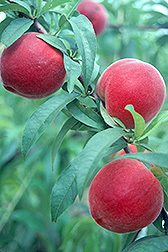 Two new peach varieties, Gulfking and Gulfcrest, were made available for planting in the summer of 2003 and will show up in markets, in limited quantity, next summer. Each of these varieties was developed in collaborations between Thomas Beckman in the Southeastern Fruit and Tree Nut Research Laboratory in Byron, Georgia, the University of Georgia, and the University of Florida. Both varieties are a nonmelting type peach that resists bruising and allows for more on-tree ripening. "These peaches may show up in the markets as early as 2005, but certainly in 2006," says Beckman. Gulfking originated from a cross of UFGold and an unreleased selection that itself was a cross between Sunprince and Majestic. The fruit ripens 73-80 days from full bloom, typically in early May with Flordaking, currently an important variety in the early season. Gulfking is large and is 80-90 percent red over a deep-yellow to orange background skin color when ripe. Flesh is firm with good sweetness and does not brown readily on bruised or cut surfaces. Gulfcrest originated from a 1995 cross between Spring Baby and an unreleased selection that was a cross between Aztecgold and Oro A.
Gulfprince ripens from early to mid-May, extending the harvest period. The fruit is medium large and exhibits 90-95 percent red over a deep-yellow to orange background skin color. The flesh is firm with good sweetness and contains some red pigment flecks in the outer flesh on the sun-exposed side of the fruit. This variety does not brown readily on bruised or cut surfaces. Both Gulfking and Gulfcrest appear to be resistant to bacterial spot on the leaves and fruit in test plantings where known susceptible peach trees exhibit typical symptoms. But why have all these different varieties? "Growers have to have enough varieties that ripen sequentially to fill the markets' needs," says Beckman. He also cites the need to improve on the soft fruit's tendency to bruise. "Bruising is a problem for all soft fruits, and we continue to develop new peaches that can withstand the amount of handling necessary to bring them to market." In the meantime, we'll enjoy this year's bounty and wait for next summer to dive into the lush juiciness of the new peaches.—By Sharon Durham, Agricultural Research Service Information Staff. This research is part of Plant, Microbial, and Insect Genomics and Genetic Improvement, an ARS National Program (#301) described on the World Wide Web at www.nps.ars.usda.gov. Thomas Beckman is with the USDA-ARS Southeastern Fruit and Tree Nut Research Laboratory, 21 Dunbar Rd., Byron, GA 31008-9805; phone (478) 956-6436, fax (478) 956-2929. "New Peaches for the Sweet-Loving Palate" was published in the January 2005 issue of Agricultural Research magazine.